For me, the theme of connectivity starts with my personal story of connecting to my family and friends. I left my hometown in Russia when I was still a kid. I had just turned 18 as I boarded the plane to the United States with lots of dreams and hopes and a heavy heart for leaving my family behind. At first, I had to rely on phone calls to stay connected to family and friends back home. I felt lonely and scared, all by myself in a new country thousands miles away from the world I knew and things familiar to me. To stay in touch, I would buy a prepaid phone card at the local convenience store once or twice a week and call my mom. More often than that would have been too expensive, which meant I felt alone most of the time. Once I was more settled, I was able to buy a laptop and I started using Skype for video calls with my family and friends overseas. For the first time in many years we were able to see each other. We would turn on the video and chat for hours on the weekend while doing chores around the house, or sit down and have a cup of tea. It felt like we were actually spending time together despite being so far apart. 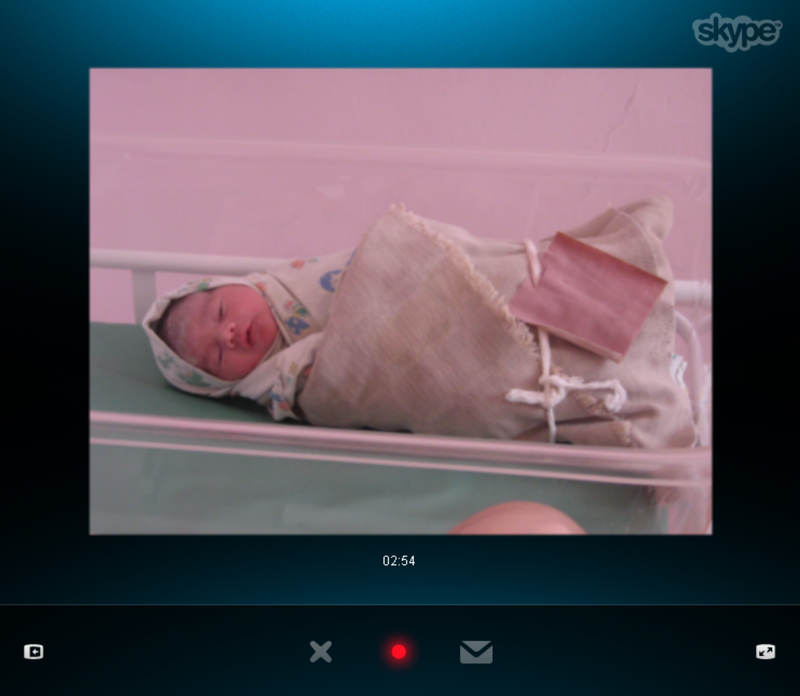 I remember when my sister had her first baby while I was away, and thanks to Skype, I was able to be part of the event even though I was miles and miles away from my family. I believe Virtual Reality (VR) is the next big leap for connecting people and bringing them closer together. It has the power to connect people across time and distances in a new, powerful way. Similar to how Skype changed the world of telecommuting a decade ago, VR will change how we connect once again. Now, I’m a product designer on Facebook Spaces and Social VR, which means I think a lot about how we can bring people closer together through technology. Because the VR ecosystem is still quite small and not everyone has a VR headset, it may seem like connecting people over VR is a “first-world problem.” However, most of our work is dedicated to building for a future in which VR is ubiquitous, and our goal (as announced by Mark Zuckerberg in 2017) is to bring a billion people into Virtual Reality. We’re not merely designing for our current users, but also for future ones. We work to explore the potential of VR to bring people closer together across time and distance, and envision a future where VR will be a way for all of us to connect to each other regardless of the devices we own. Bringing people together is what drove our first VR product — Facebook Spaces. With Facebook Spaces, you can be with your friends and family while feeling like you’re in the same room, even if you’re thousands of miles away from each other. Everyone is represented by an avatar and sits around a virtual table. That’s the core of the experience: people. Nothing is more important in Spaces than the people you’re with. Thanks to the power of technologies like the phone, video chat, and VR, we can now connect to each other even if we are in different parts of the world. But what’s unique about connecting in VR is the sense of presence you get: the feeling you’re actually there, physically present in a non-physical world. When you’re in virtual reality, what your eyes see and what your ears hear is so real, you might believe it is. Neither phone nor video calling has ever given me a feeling of being this present with someone. VR changes that by providing a sense of presence. Self-presence is your physical and emotional representation when you’re in VR. It’s important that you feel like you and that’s a very individual feeling. 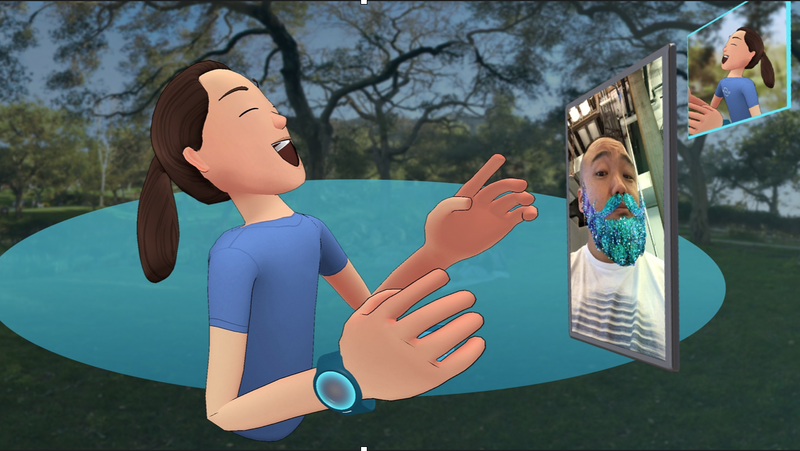 When designing Facebook Spaces, we experimented with different types of avatar systems and different visual treatments including: animals, realistic 3D scans vs abstract avatars, 3D vs flat eye textures, blocky heads vs friendlier curves, etc. And what we realized, is that if we try to make an avatar look exactly like you, there’s always a risk of falling into the uncanny valley, where the more realistic you make it the more uncomfortable it can feel. In the end, we landed on a charming and inviting style of avatar. They work really well within today’s constraints of VR systems and still allow expressiveness and self representation so my friends and family can recognize me in VR, without falling into the uncanny valley. Social presence is a sense of being with others: anytime, anywhere. It’s the feeling of being present with them. We recognize the people we know in real life through small cues, like the way they tilt their head when they’re concerned or their quirky laugh. As humans, we are experts at recognizing body language, gestures and behavior, so if my friend’s avatar in VR suddenly acts in an unexpected or robotic way, it can break the feeling of social presence, of being there together. Some examples of social presence and what effects it are hand gestures, body movement, eye gaze, facial expressions, etc. They need to feel believable to maintain a sense of presence. For example, in VR, as in real life, maintaining eye contact during a conversation makes you feel engaged and connected. It makes you feel present in the space with that person. Since VR headsets today aren’t capable of tracking your eyes, we had to design a way for our avatars to predict where the person might be looking as accurately as we can. For example, if we know that you are engaged in some type of activity like drawing and your head is pointed in the same direction, your gaze will follow your hand as you draw with the marker. We also quickly learned how important hands can be in a social interaction. We’ve found in research that people could recognize their significant other from other people simply through recognizing their hand gestures. And since today’s VR systems are only tracking the hands and the head, we had to simulate the avatar’s torso and arms, so the bodily movements feel believable and you feel that the person in front of you is real or at least as real as you can get in a VR world. Another key element is spatial presence — the feeling that you’re there, no matter where that may be. The environment you design will affect the emotional state of people and the type of social interaction that can happen in that space. When designing a VR environment, one of the first questions I ask myself is “How do we want people to feel in that space?” Big vaulted cathedral with high ceilings will give you a sense of awe, or a small damp and dark basement will can make you feel uncomfortable, anxious or even scared. In Spaces we keep the environment neutral and let people be in control of their space. You can use any 360 photo or video available on Facebook to set as an environment in Spaces. This means you can visit places like Tanzania or explore the jungles of Bolivia. You can really choose to be anywhere, whether that’s a place you’d love to visit someday, or a memory you want to relive. 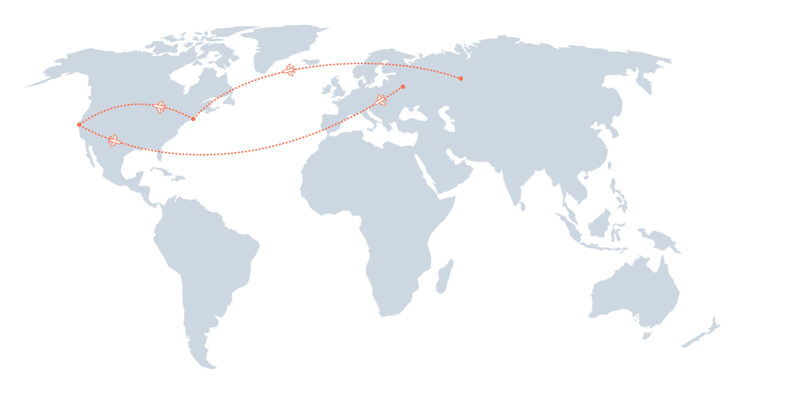 And you can show it to your friends and family, even though they might be on the opposite side of the world from you and you can travel to all of these places together. One of the most powerful aspects of VR is synchronicity: we can be together at the same time. There is something magical about being with your friends and feeling like you’re in the same room, even if you’re thousands of miles apart from each other in the real world. Once you’re together in VR, you can teleport to different places together, play games, watch movies, and more. Unfortunately, face to face interactions in VR often require advance planning and scheduling. Other Social VR products like Altspace solve the need to plan in advance with events. You have planned events on your calendar and you know that if you join at specific time you are bound to meet some new or old friends in the VR space. You can also now meet members of your community from Facebook Groups in VR. Through groups, you can continue building your relationships and connections in VR around the topic you all care about in a new immersive way. I can host a group for all my classmates from university in Russia or continue working on my passion architectural project with my friends in VR. Another part of connecting across time is asynchronous connections. We can stay connected even though we might not be in VR at the same time. In Spaces, asynchronous connections can happen through selfies, videos and live broadcast that can help you catch up on what friends have been up to on News Feed and stay connected through shared memories. 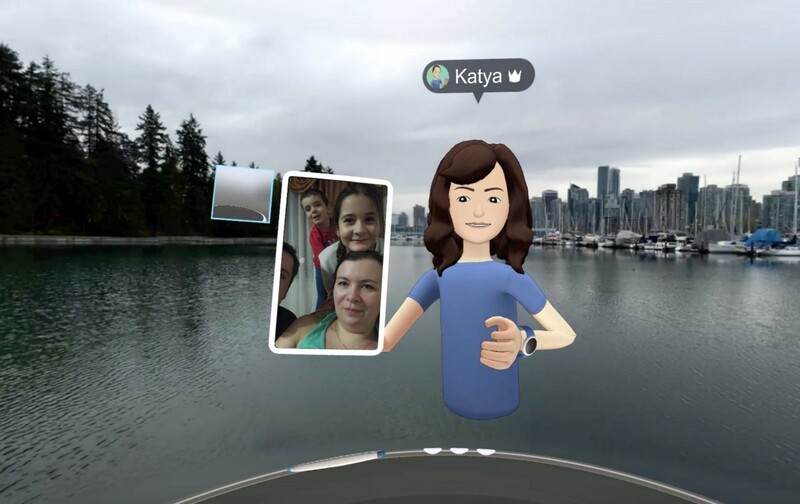 Because of 11 hours time difference, sometimes it’s hard to connect with my family and friends back in Russia, so I can post my experiences in Facebook Spaces to News Feed and they’ll see it when they wake up and connect with me. VR is still quite young and not many people have a VR headset yet. So how can we bring the rest of the world into VR? In designing Facebook Spaces, we think about connections being symmetrical and asymmetrical. A symmetrical connection is when two people are in VR in-person. Asymmetrical is when you use a non-immersive device such as your phone tablet or laptop to connect to a friend in VR. Asymmetrical connection empowers anyone to be a part of VR experience. Through the power of asymmetrical connections, everyone can be a first class citizen and take part in VR regardless of the device they are on. None of my family members have a VR headset so when I am in VR it can feel quite lonely. I wish they were there with me. When designing Spaces, we realized that we need to connect you to your friends and family regardless of the device they have. Most people have a phone so we built a feature so that you can call your friends and family using Messenger video chat. And it feels so much more than just a video — we watch videos, play games and experience things together. I can also connect with my friends and invite them to be part of my VR experience by going Live from Facebook Spaces. They can join me from their phones or computers on Facebook, and take part in a conversation through their comments or reactions. And we designed this experience to be engaging on both sides. Once you grab a friend’s comment in VR it becomes a 3D object. We also had an experiment where you can send an emoji, like a smiley face, a heart or a balloon, in a Live comment and it will become a full 3D emoji in VR, which can be very magical. From phone calls to video to VR, we all look to connect to people we care about. Through connection with other people, we feel more connected to the world around us and feel loved and cared for, and technology should help us come closer together rather than push us apart. With VR and Facebook Spaces, any distance, technology, or time that separate you from people you care about become obsolete. The next generation should feel empowered to explore the planet while still feeling close to those they care about. I look forward to the time I meet my mom, sister and niece in VR no matter where they or I am in the world. We can meet on the weekends and watch a movie together or I can show them pictures from the recent trip I took to Japan. We’ll celebrate our birthdays and create memories that will bring us even closer together. Thanks to Christophe Tauziet, Andrea Zeller, and Tanner Christensen.